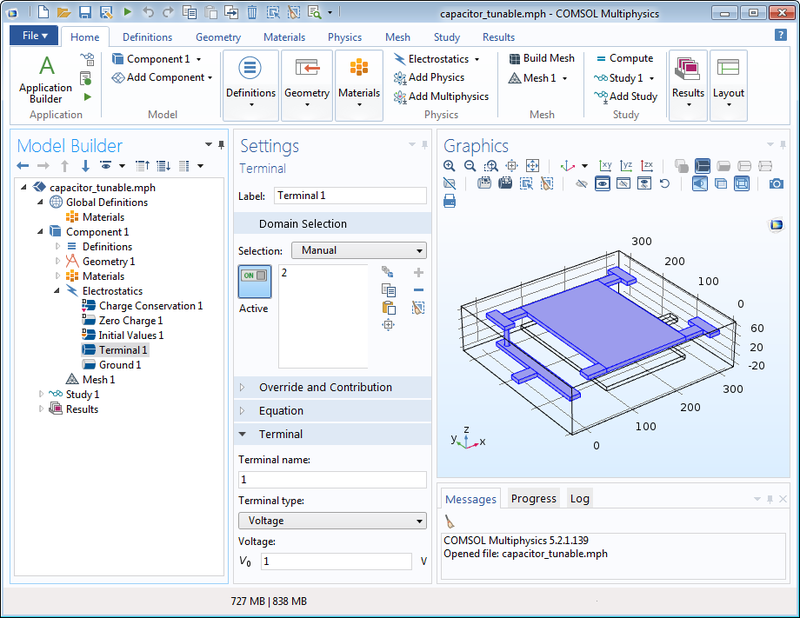 For users of the Plasma Module, COMSOL Multiphysics® version 5.2a brings reorganized plasma physics interfaces for more efficient model setup and workflow, including the ability to seamlessly couple multiphysics interfaces in your plasma simulation, as well as a new Domain Terminal feature for geometrically complex electrodes. 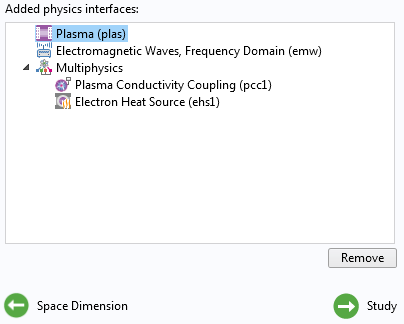 In COMSOL Multiphysics® version 5.2a, the DC Discharge and Capacitively Coupled Plasma interfaces have been replaced with a new interface called Plasma. The Plasma interface includes all of the functionality of the DC Discharge and Capacitively Coupled Plasma interfaces. Upon opening a model containing the DC Discharge and Capacitively Coupled Plasma interfaces, it is automatically converted to the new Plasma interface. However, to provide backward compatibility, the original interface Label, Name, and Tag are retained. The Inductively Coupled Plasma and Microwave Plasma interfaces have been reimplemented as multiphysics interfaces combining the Plasma and Magnetic Fields interfaces, and the Plasma and Electromagnetic Waves, Frequency Domain interfaces, respectively. The table below summarizes these changes. 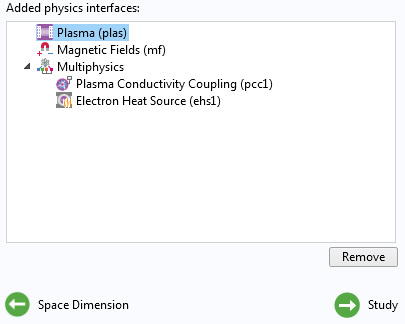 Coupling between the high-frequency fields and plasma for the Inductively Coupled Plasma and Microwave Plasma interfaces is now done using multiphysics coupling features. Using cold plasma approximation, the Plasma Conductivity Coupling multiphysics interface computes the electric conductivity required by the Magnetic Fields and Electromagnetic Waves, Frequency Domain interfaces based on the electron density, collision frequency, and angular frequency. The Electron Heat Source multiphysics interface computes the collisional heating of electrons based on the plasma conductivity and electric field. The Model Wizard after adding the new Microwave Plasma interface. The Model Wizard after adding the new Inductively Coupled Plasma interface. The old Inductively Coupled Plasma and Microwave Plasma interfaces can still be opened, edited, and solved. 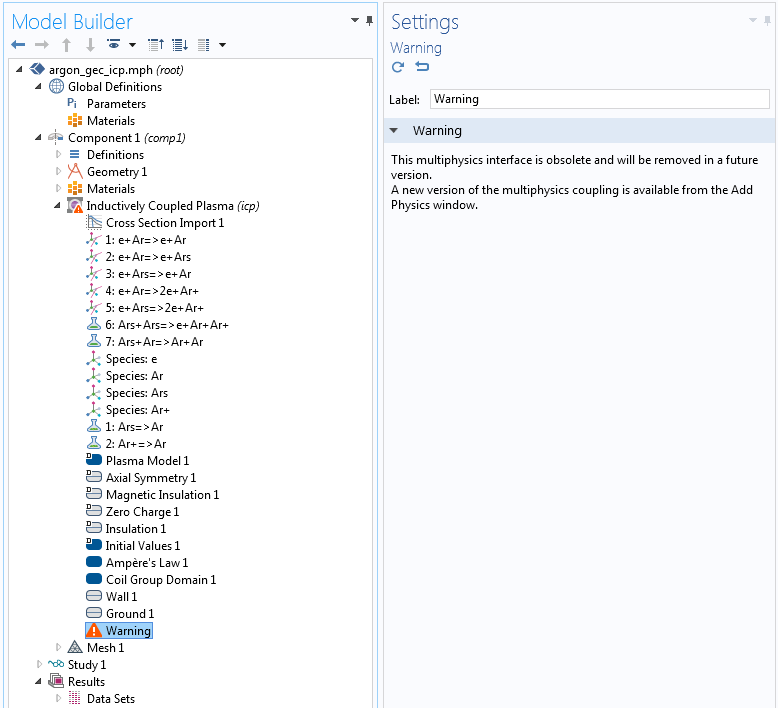 When such a model is opened, a warning is given indicating that the interface is obsolete and will eventually be removed.